The engineers were trying to build the lightest airplane with the biggest motor and still make it capable of surviving carrier landings. To do this, they designed the wings lighter and weaker than normal but intended to shed about three feet on each side should it be overstressed. It could fly back to the carrier and land, even if only one wing separated. The concept worked in testing, and everyone was happy until it hit the fleet. 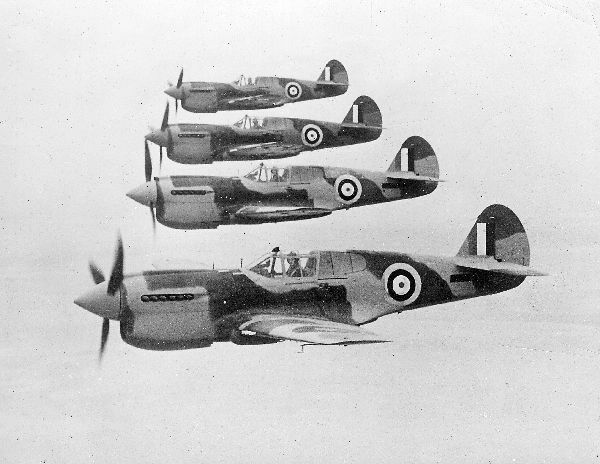 Pilots loved the airplane because it was fast and had the fastest rate of climb of any propeller-driven fighter in the War. 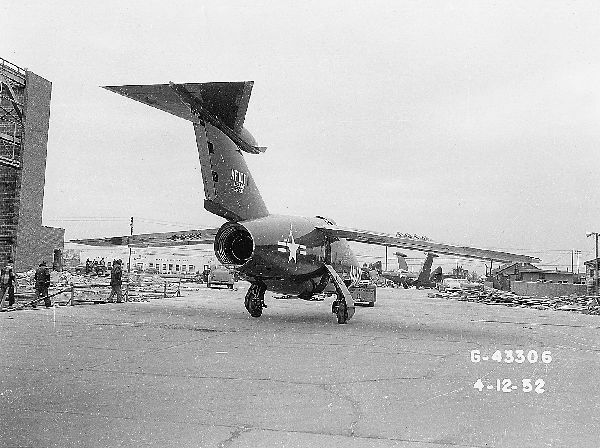 Unfortunately, after a few weeks of glowing operational reports on the Bearcat, word came back that a pilot had shed one of its two wingtips in a dive-bombing-run pull-out and had augured in. Several similar occurrences followed, and the Navy and Grumman became greatly concerned. 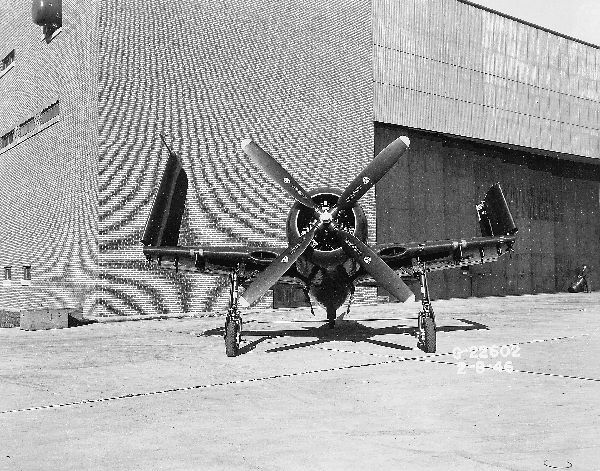 The flight envelope of the Bearcat was severely restricted, and it was immediately removed from carrier operations. 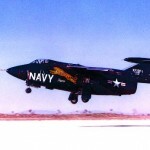 The Navy and Grumman agreed that a better way to guarantee the wingtip separation was to put a 12-inch strip of prima cord (an explosive rope used to detonate dynamite) just outboard of both wing break joints and have a set of electrical microswitches at both break joints. 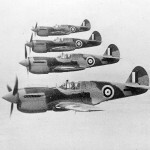 These microswitches would activate the other tip’s explosive device at the instant the first wingtip came off. (We called them “icebox” switches, which shows where we were in technical antiquity!) The ground tests were spectacular, to say the least. Lots of noise, smoke and flying airplane pieces. After several successful ground tests, we rigged up a Bearcat with this “Fourth of July” system, and I was sent off to do my job as a test pilot. One of the tips was structured to come off at 5G, and according to theory, the icebox microswitch in the other wing would electrically activate the prima cord and blow the other tip off at the same instant. 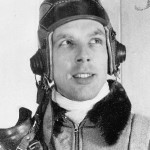 Three hundred and twenty knots at 7,500 feet altitude in a 30-degree dive angle was selected as the demonstration point. To record the action, we had photographers in chase airplanes on both sides of my Bearcat. I pulled 6G to ensure the 5G rivet joint would fail and activate the other tip explosive. Lo and behold, the genies of fate again urinated on the pillars of science. With an impressive flash of fire, smoke and debris, one weakened tip left the airplane as predicted at 5G, but the other remained as fixed to the wing as ever. 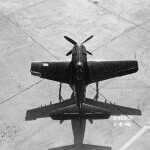 From the cockpit, a Bearcat appears to be nothing more than a huge engine with tiny wings. However, to look out and see that not only has one short wing become even shorter but also that the other one is full of holes gets your immediate attention. One of my chase pilots came in and inspected the wing damage. He saw a large hole in the bottom surface, proving the prima cord had indeed fired, as predicted, but the wingtip had remained firmly attached even though the 12-inch hole was in the most critical stress area—the lower skin, or tension area. Good old Grumman Ironworks! 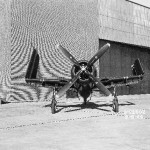 Fortunately, the 12-inch hole did not cause any aerodynamic disturbance as might have been expected, and I had already landed the F8F with single tips removed and was ready for the experience, so the landing was uneventful. Back to the old drawing board. 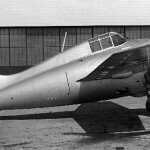 The project engineer suggested 26 inches of prima cord be used on the next flight, after ground tests were run to check whether that amount of explosive would affect proper wingtip severance. On the next flight, when I pulled 6G, both tips departed as planned amid much smoke and parts flying off the airplane. Both chase pilots were much more excited than I was by the visual effects; I hadn’t seen them because my eyes were glued to the accelerometer in the cockpit. They said it looked as if the airplane had blown up when both tips blew and both the ailerons and wingtip sections departed the bird. There were two very smoky explosions as two wingtips and two aileron halves came off in very rapid succession along with much shattered metal. The wingtip ends were cleanly severed as hoped for. There weren’t even small pieces of metal outboard of the end rib to suggest an explosion had done the surgery. 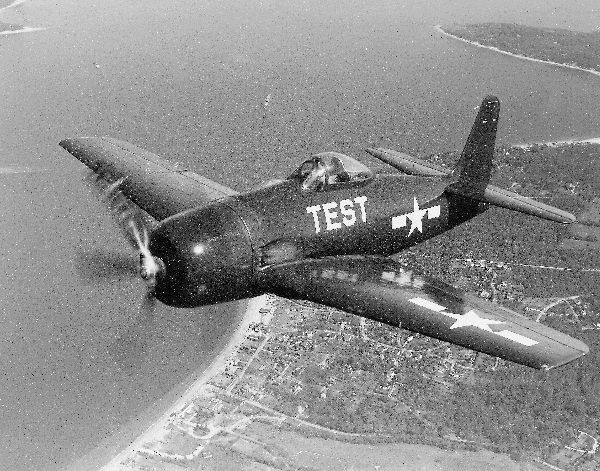 The test was considered a great success by Grumman and the Navy. More important, I had survived the tests, which I considered an even bigger success. 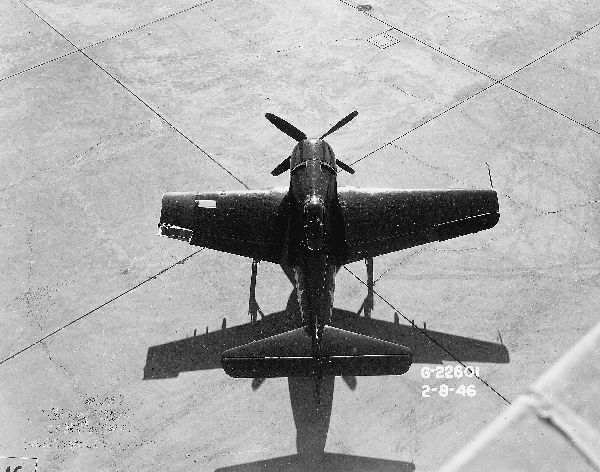 On April 7, 1944, during my first Hellcat demo flight in F6F-3 Bu. No 26101, I pushed over from 28,000 feet to what I had estimated to be a 60-degree dive angle and totally concentrated on the buildup of airspeed rather than on my rapidly decreasing altitude. With full power, the aircraft’s descent rate soon exceeded 38,000 feet per minute! I estimated that I would attain 485mph indicated airspeed just as I went through 10,000 feet, and I planned to make the easy, 2.5G pull-out at that point. To maintain the 60-degree dive angle during the speed buildup, I had to continually re-trim the elevator with more nose-down to overcome the aircraft’s natural tendency to pitch up as speed increased. I was about to start the simple pull-out when I noticed with great alarm that the aircraft didn’t require any more nose downtrim. The nose was quickly going down of its own volition, and that rapidly increased the dive angle without any re-trimming, push force, or desire on my part! I was no longer flying the plane; I was a passenger. To counteract this frightening condition, I pulled the stick aft as far as I thought I had to to arrest the nose-down pitch. Nothing happened! I pulled much harder. Despite my maximum-effort two-handed pull on the stick, the nose still dropped, further increasing the dive angle. The stick seemed to be solidly implanted in concrete, and the nose-down dive angle continued to increase. Terrified, I roared down through 6,000 feet. It was abundantly clear that something way beyond my comprehension and capabilities was directing the aircraft straight into the ground at more than 700 feet per second. I had less than 10 seconds to live. I instinctively yanked the throttle closed and then continued my forceful two-handed pull on the stick while praying for recovery. A long second or two later, all hell broke loose. The airplane started to buffet violently and pitched up to 4G. Before I was able to release the stick from my adrenaline-powered frantic pulling, my efforts took the G-force to 7—with increasing buffeting. I bottomed out at below 2,500 feet, and the ground receded below me. 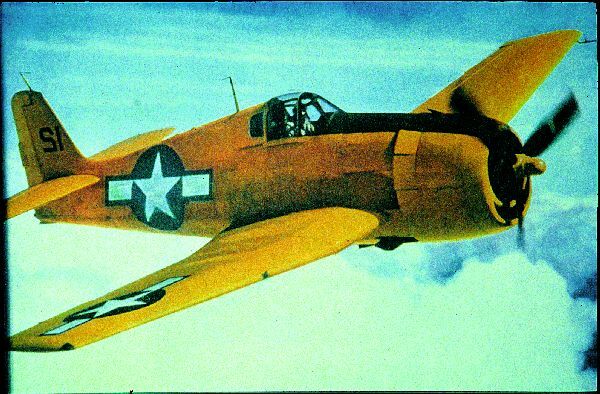 When I had regained a little of my composure, I checked the aircraft for damage and controllability, and having had enough excitement for the day, I slowly flew back to Grumman in a mental fog. I landed completely befuddled and greatly shaken. 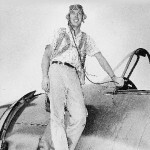 When I turned the engine off, I was trembling so much that I told Scottie McClain, my plane captain, that I would stay in the cockpit to write a few notes while the flight was still fresh in my mind. He tactfully left me and went to tend to other aircraft. Had he stayed, he would have seen a hand so shaky that it couldn’t hold a pencil, let alone write with it. I knew that I would fall on my face if I tried to climb out right then. Examination revealed that the buffeting had indeed bent both of the stabilizers at their mid-span—the right one upward about 15 degrees and the left one downward about 15 degrees. A complete inspection of the entire aircraft didn’t show anything else bent or rivets pulled—amazing! 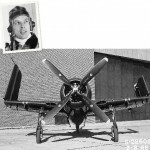 I became an instant member of the “Grumman Iron Works”—an unofficial fraternity of Navy pilots who had greatly over-stressed Grumman aircraft and returned to fly another day in the same airplane. The most confounding aspect of my post-flight experience was that nobody in engineering could explain the frozen controls or my Hellcat’s automatic, and uncontrollable, pitch-down as I passed through 10,000 feet. Nor could they explain its automatic pitch-up or why it had regained pullout control as I passed through 6,000 feet. I was distressed because I knew that to satisfy the Navy, I would have to repeat that dive after the stabilizers had been replaced. 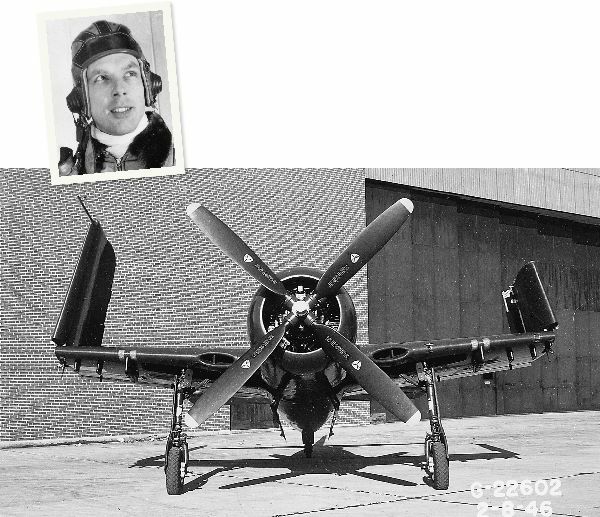 One of Grumman’s research engineers said that the Hellcat generated supersonic shock waves over its full wingspan at .75 Mach. (On my first dive, I reached .77 Mach!) He explained that my closing the throttle had greatly increased the airplane’s drag, and that, coupled with the normal increase of the speed of sound with decreasing altitude, had reduced my Mach number sufficiently to bring the aircraft out of its critical shock-wave compressibility condition. Needless to say, I began to take a much greater interest in limiting my Hellcat demonstrations to conditions as far away from this “new” compressibility range as I could. The ground had come much too close for comfort. 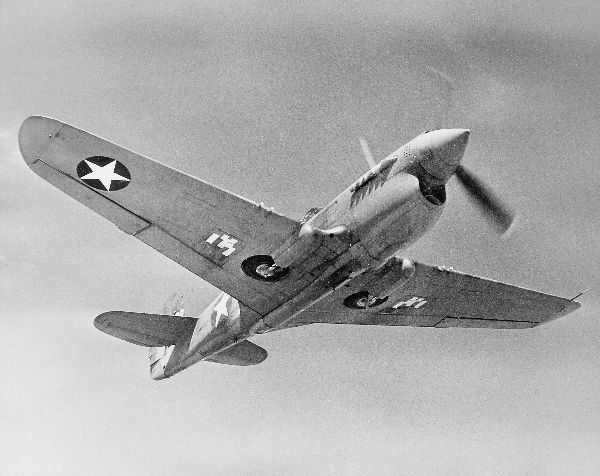 I was on final approach to Grumman’s airport in a P-40N that had been loaned to us by the USAAF for comparative testing, and during the test flight I had found it to have very poor slow-speed characteristics. About that time, another test pilot buzzed the field coming under me in the same direction. This was not an unusual occurrence in those days when the war-effort syndrome allowed test pilots to get away with murder when it came to breaking the rules. Having just found out that the Warhawk had much better power acceleration than the Hellcat, I decided to pull up my wheels and flaps and give him a go at a rat race (which was also covered by the same syndrome). I pushed the throttle forward and pulled up into a steep fighter climb as the wheels and flaps were retracting. At about 700 feet, my exuberance ended most abruptly when the airplane stalled unexpectedly and violently. The control stick and rudder pedals flapped loosely around the cockpit, and the airplane snapped back and forth in a roll. Those are the last events I remember coherently. The airplane was shaking violently. It then started into a spin—still shaking like a dog getting rid of a water bath. I could see the hangars with great clarity and with a strange detachment. I was stupefied—mesmerized—and seemed to be sitting on the sidelines watching this unbelievable panorama unfolding. My mind was a blank as to what action I should be taking in this horrible kaleidoscope I was watching as if I didn’t have a concern in the world. It just couldn’t be happening to me! The next thing I remember was moving level at 50 feet over the potato fields west of the Grumman airport with the ground whizzing by at a great speed. I was still mentally only riding this P-40. I was not flying it because the maneuver it had just done was completely out of my frame of reference, even in nightmares. I finally noted that the throttle was pushed through both of the limiting wires, and the engine was straining with much more power than I had heard or felt during takeoff. I was in War Emergency Power. After a few seconds, I came to my senses, retarded the throttle and climbed to 1,500 feet. I turned back rapidly to the airport, as the sun had almost set and it was rapidly getting dark. Were I a test pilot of greater experience, I might have related in my reminiscence that I calmed down, remembered all the instructions in the handbook about spins, jotted some meaningful notes about the “incident” and made a nonchalant, smooth, three-point landing. I was totally without any of these movie-star proclivities. I was still stupefied. I flew around the airport without calling the tower and talked to myself like a Dutch uncle. I said, “You stupid SOB. You can’t land this airplane. You are running out of gas. It is getting dark and you have to land this airplane,” etc., etc. My conversation was also sprinkled with four-letter words impugning my legal birthright. After too many circuits of the field, I humbly called the tower and was given landing clearance. They were charitable and made no embarrassing commentary. I made a long, airline-style approach at a speed considerably higher than required and landed without further ado. I taxied back to the tower, where all the pilots were still gathered. They had seen my spin and wanted to see the color of my face after that farce. After the propeller had stopped rotating, the airplane continued to shake. When it stopped shaking, I did, too, and guessed that I might now be able to stand on my own two feet. I got out to the total silence of the pilot mob watching. Later, they told me that I made a turn-and-a-half spin, came down below the hangars behind them and scurried out to the west at 50 feet off the ground like a bat out of hell. I had no recollection of the number of turns of that spin until they told me. 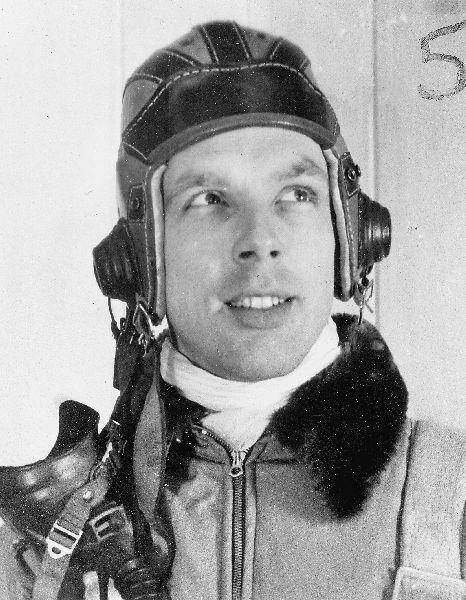 That flight was one of the most impressive of my test-pilot career. I learned to listen to airplanes for everything they had to tell me. 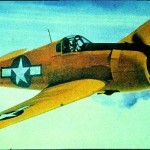 I became a born-again-Christian immediately after that 30-second episode of my P-40 flight. 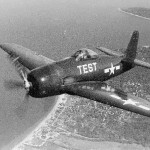 The Jaguar was designed with a variable sweep wing (15 to 45 degrees) and nothing about the airplane was “normal.” So, as Jaguar project pilot, I was most pleased that Grumman decided on Edwards Air Force Base for the Jaguar’s initial test flights. The 8,000-foot runway extended into a 7-mile-long lakebed that was as smooth as a billiard table. 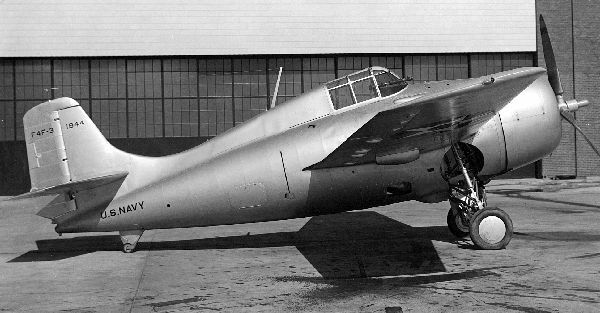 We made an immediate impression on the folks at Edwards (a bad one), and when I made my first run to “attempt” a liftoff, it was obvious to the audience that Grumman had come up with an airplane that would fly strangely, if at all. The airplane and I lurched up and down the runway as if one or the other, or both, were drunk. These attempts to fly went on for a week or so, causing much hilarity, but my real concern was that I couldn’t get the necessary feel or the required guts to fly it higher than 10 feet from terra firma. 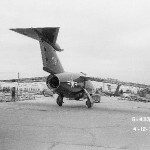 On May 19, 1952, I got the Jaguar up to 160 knots on the runway, at which speed the canard tail was found to have sufficient control for a first official flight. It was a disaster as far as accomplishing anything was concerned because just about every system refused to work. Two days and several fixes later, I flew the Jaguar again. At 12,000 feet above the lakebed on a very calm morning, I was just about to stall it for the first time when it was rocked by a violent explosion in the engine and it pitched up 20 degrees! My chase pilot told me that several large balls of fire erupted from my tailpipe followed by billowing black smoke. Later he told me that he had heard the explosion too. It surely scared the hell out of me! I hurriedly shut down the engine, got the airplane back under control and began an emergency gliding descent back to the lakebed runway. The accompanying T-33 chase plane pulled ahead of me as I came in for my dead-stick landing. I suddenly saw that the pilot of the chase plane had forgotten to lower his landing gear. I called him, and his landing gear extended just as he touched down. Because I had been paying attention to my chase airplane, my landing had to be seen to be believed: the XF10F leapt and bounced all over the place—practically out of control. The best that could be said of my landing was that it was short! On the 23rd flight, my Plexiglas canopy shattered completely, leaving only the frame attached to the aircraft. Buffeted around violently in the cockpit, I instinctively chopped the throttle. The next thing I remember, I was down to 200mph and the buffeting had eased. I knew from my extensive liftoff experience that at any normal approach speed, the horizontal tail would go wild from the disturbed, canopy-open airflow. Consequently, I knew that I had to put the airplane on the lakebed going very fast—around 200mph. Just before landing, the chase pilot called me to say that the ejection-seat face curtain was fully extended and flapping on the back of the fiberglass section of the canopy frame, a fact confirmed by a glance in my rearview mirror. I reached back, grabbed the rubber handle on the curtain and put it between my teeth, thinking, “What a grade-B movie this is!” As the face curtain had fully extended, I knew the seat was armed and ready to fire, so after touching down on the lakebed and still rolling 100mph, I hurriedly unbuckled, scrambled out of the cockpit and straddled the front fuselage ahead of the windshield, facing aft. I had managed to get back onto the ground, and I had no taste for an ejection seat killing me by blowing me several hundred feet in the air. 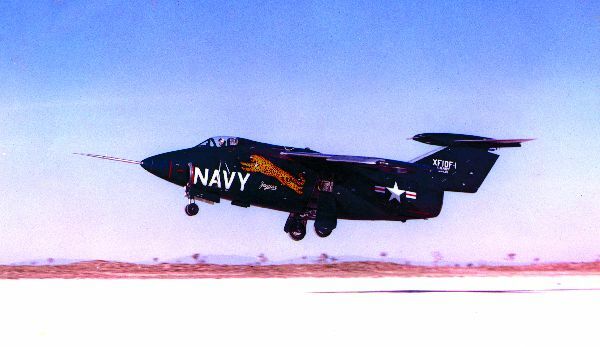 Several miles later, the Jaguar came to a standstill on the dry lake after completing a wide ground loop. We later found that debris from the canopy had pulled the firing pin 99 percent out of its detent. I had come close once again. I had a pin guard installed immediately. 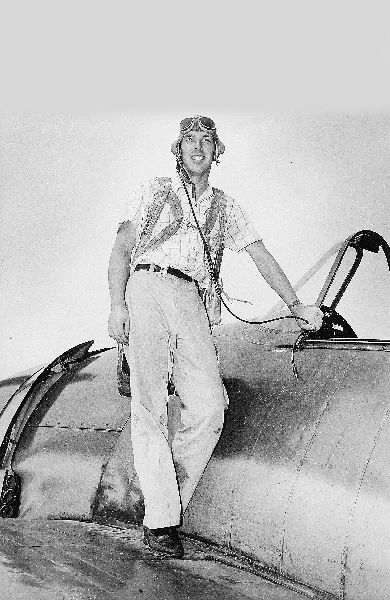 During the ninth landing, as part of an airshow for then Secretary of the Navy Dan Kimball, in an effort to demonstrate a very short landing, I had retarded the throttle to idle and slowed down to 15mph slower than any airspeed I had ever flown the airplane before. I found myself in the then unknown, and therefore unexpected, T-tail pitch-up range. (When it was later discovered in other T-tail aircraft, it was called “deep stall.”) I pushed full-forward stick, but the airplane did not react. I was horrified that I was at landing altitude and had no control of the airplane. I immediately advanced the throttle to full power, hoping to accelerate out of the pitch-up. The next 21 seconds, waiting for the engine to spool up, seemed like 21 years! The airplane was now descending at more than 2,000 feet per minute and slowing down without any effective control by me to speed it up. The engine at last spooled up to full power 50 feet off the ground and slowed my descent rate somewhat, but the Jaguar hit the lakebed at more than 20 feet per second, as measured by a camera on the ground. This is one foot per second more than a Navy carrier structural demonstration required! It should have crashed; however, I rolled barely 900 feet to a stop without braking! Grumman Ironworks had saved the day. 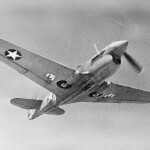 The Secretary of the Navy was convinced that the Jaguar was the most phenomenal airplane he had ever seen. The next day, my boss Bob Hall called me up and said, “I don’t know what kind of airshow you put on, but the Secretary thought it was great, and he has ordered 30 more!” The Secretary sent me a letter of congratulations; little did he know of the flight’s near catastrophe.